For over 100 years, Lockheed Martin has been involved in various industries, working hand-in-hand to innovate and build some of the greatest scientific technologies. This year, they’re celebrating the 5th annual U.S.A. Science and Engineering Festival. 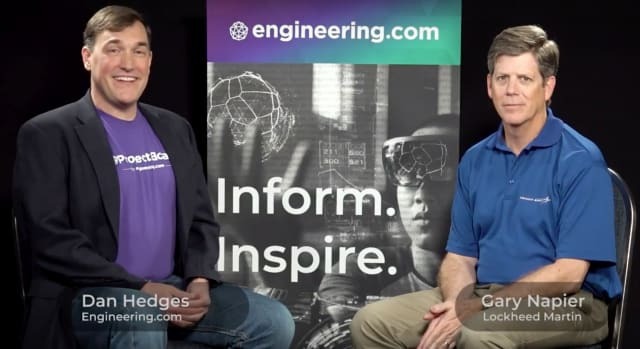 Engineering.com’s Dan Hedges sat down with Gary Napier, the Communications Manager of Lockheed Martin, during the festival. Lockheed Martin has been a founding sponsor for the past 5 festivals and prides itself on promoting STEM education to kids. The company aims to inspire kids to get into the STEM industry while they’re young, especially girls and those from diverse backgrounds. “The more diverse the team is, the better the end product,” says Napier. According to him, with technology evolving, the demand for engineers will only increase. In fact, Lockheed Martin will be in need of over 100,000 tech engineers for the next 15 years, Napier says. This includes software engineers, mathematicians, and scientists. Lockheed's latest project is the InSight Lander, which they built for NASA for an upcoming Mars mission. Lockheed Martin has built 11 of the 21 missions that have traveled to Mars so far. InSight is not an orbiter, but a lander—it will land on the surface of Mars and deploy seismometers and temperature probes. According to Napier, it will dig 15 to 16 feet into the surface to measure how the temperature fluctuates along different seasons. A seismometer will listen to how Mars quakes and how it is affected by meteorites hitting the surface. The data will be used to understand the interior structure of Mars. Lockheed will also be flying InSight. Entry-and-descent landing is expected to happen around November, says Napier. Lockheed’s next project with NASA is the Orion spacecraft. It will serve as a capsule designed for deep space exploration. In fact, it was specifically designed to spend up to 1000 days in deep space. The test flight is scheduled for December 2019. Napier also talked about a concept for a small space station called the Mars Base Camp, which will utilize multiple Orion capsules, habitats, and solar electric propulsion. On the question of sending humans to Mars, Napier had only this to say: "The first astronauts to Mars are probably in middle school right now, it's that close. It's not the technology that we have to really invent, it's all there. It's a matter of that determination and drive." However, he also says the first mission will probably be an orbital mission. "Some of the first missions are typically fly-bys, and then you go into orbit. And then, later on, you get to the really hard stuff and you land. So the reality of sending the very first mission to Mars with humans on board and landing it probably isn't the right approach." For more on the Mars Base Camp and erecting houses on Mars, check out the interview below.